Chanel Rouge Coco Hydrating Creme Lip Color in Charactere (available here) - $32.50 Part of the Les Essentiels de Chanel makeup colllection for fall 2012. Chanel presents a modern interpretation of classic creme lip colour as an homage to the rich life and legacy of Coco Chanel. New lightweight lip colour glides on for easy application and features a Hydratendre complex to help soften, soothe, and condition lips - even boosting their ability to hold in moisture - for a plumper, smoother and healthier-looking appearance. Part of the newly launched (and perhaps a bit seasonally out of place) fall 2012 collection by Chanel, the Rouge Coco lipstick in Charactere is a mauve-plum with hints of brown. There is very fine golden shimmer scattered throughout the lipstick. While it looks quite scary dark in the tube, on the lips it turns out much more of a neutral shade, perhaps because it gets sheered out by the shimmer. My lips have a naturally mauve-y undertone to them, but I do think this lipstick would be a brownish-plum shade on almost everyone. I have applied it directly from the tube and it gives reasonably opaque coverage, and I have very unevenly pigmented lips! If I use a brush to apply this, though, it gives a very sheer effect - picking up almost no color. 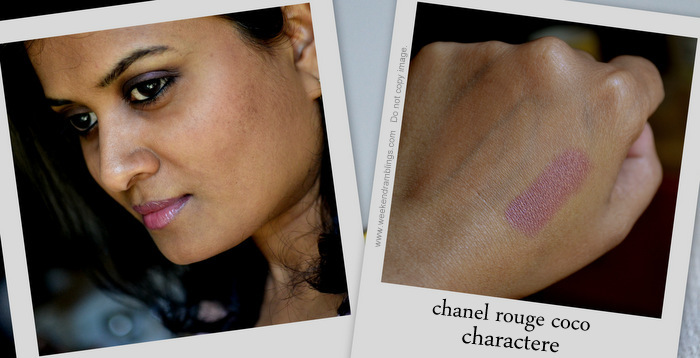 Reading through some posts on Specktra, I read about comparisons between Chanel Charactere and NARS Vendanges (part of the NARS summer 2012 lineup). Both lipsticks are a dark plum with hints of brown, but NARS Vendanges is slightly more sheerer, glossier, and doesn't have the shimmer in it. Charactere, in comparison, seems more matte/opaque and a tiny bit more mauve. Here are some photos. I think the NARS and the Chanel version are quite similar in terms of color and coverage. While they do look slightly different, any one of these would be quite sufficient - unless you are a crazy beauty blogger :P Whether or not you want shimmer in your lipstick could be one way to decide or you could let your wallet decide - the NARS lipstick is a tad less expensive at $24. Chanel Rouge Coco Lipstick in Charactere is a plummy brownish lipstick that is a perfect fall shade - a neutral plum for those of you who aren't into the really dark colors that dominate the autumn color palette. I don't think it is that unique a shade but pretty, nevertheless. It looked very dark but once applied turns out to be a nice wearable not-so-dark shade. I love how it looks on you but I'm not so sure it would suit my pale skin. Too bad because the color is gorgeous. Oh you could just use a lip brush and get a sheerer wash of color..it doesn't show up on my lips that way cos they are already quite pigmented..
Etole is a beautiful color! Are you indian? I am too, and with your coloring, i would recommend trying out Chanel "Riviere" and Covergirl Natureluxe "Hibiscus". It really works for me! Also, what foundation do you use? I found it really hard to match my skintone, but did it eventually... Any recommendations?